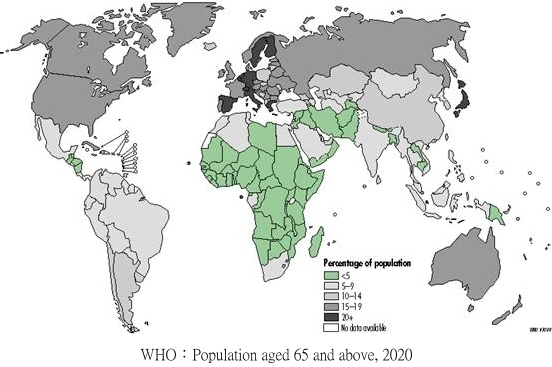 Population aging is the challenge that the whole world need to face together. According to statistics released by the United Nations, the number of elder over sixty in the world in 2000 was over 600 million and it will increase to 1200 million in 2025. Although the extent of aging in Taiwan is not as large as that in Japan, Europe, or America, yet the speed of aging in our country is much faster than in those areas. According to CEPD statistic database in 2010, Taiwan was one of the fastest aging nations in the world and in 2017 Taiwan will be officially an aging society. To face this challenge, the United Nations and other international organizations have approved many declarations and action plans which emphasize the concept of ‘active aging’. That is, the elders should be encouraged to develop their potential through lifelong learning, and to participate in volunteer work and citizen affairs. It is also desirable for them to learn to make use of the modern technology of information and communication so that with enhanced social support, they can develop their potential to the full. Due to population aging, the research on aging has received great attention in recent years and the scope of research has been extended from the traditional medicine field to the social science field. The research areas on aging include medicine, biology, public health, nursing, psychology, sociology, social work, politics and economics. Therefore, the interdisciplinary integration has become inevitable. Moreover, it is also important to develop the concept of ‘successful aging’ to the effect that the elders not only need to keep both body and mind in good shape, but also need to live actively by participating in social affairs. Thus the research on aging society has become a unified research with deep concern for humanity, social support, and technology innovation.